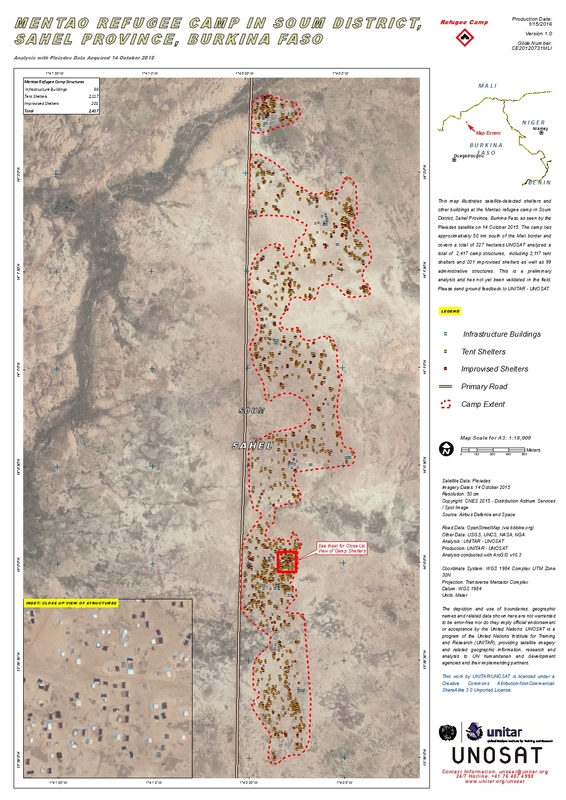 This map illustrates satellite-detected shelters and other buildings at the Mentao refugee camp in Soum District, Sahel Province, Burkina Faso as seen by the Pleiades satellite on 14 October 2015. The camp lies approximatively 50 km south of the Mali border and covers a total of 327 hectares.UNOSAT analyzed a total of 2,417 camp structures, including 2,117 tent shelters and 201 improvised shelters as well as 99 administrative structures. This is a preliminary analysis and has not yet been validated in the field. Please send ground feedback to UNITAR - UNOSAT.